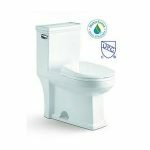 The Vive is one of the best rated raised toilet seats. This raised toilet seat set adds 5 inches to your standard toilet bowl. It is ergonomically designed for comfort and the side arms can be removed without tools. It can support up to 250 pounds and comes with a lifetime guarantee for its durability. It is a little bit more expensive than some other options available, but most agree it is worth the extra money. 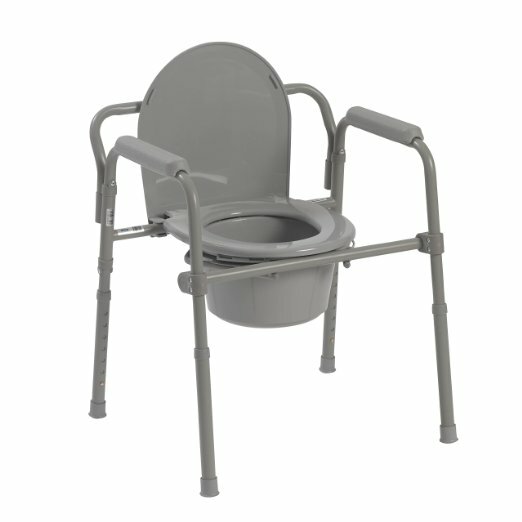 The Drive Medical seats are some of the most reviewed raised toilets. 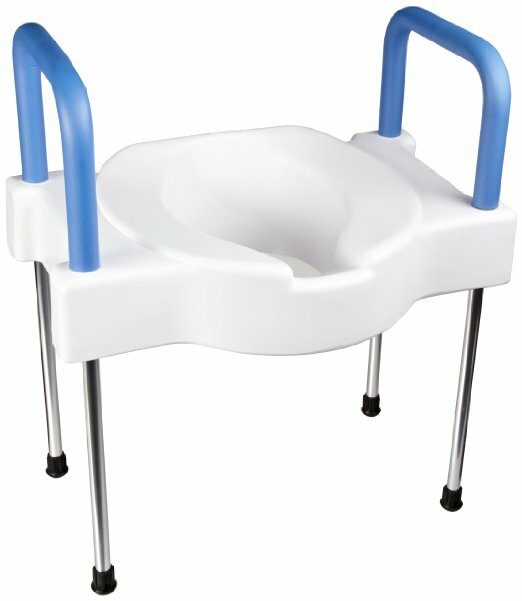 This toilet seat riser has removable arms and adds a total of 3.5” to your toilet seat. 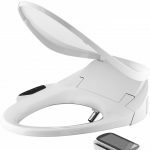 It is easy to mount and uses your existing toilet seat. The arms are padded for your comfort and has a weight capacity of 300 pounds. Some people encountered a few issues mounting it to their existing seat, but most agreed it was pretty simple. Overall, it has pretty good reviews and, for the price, its worth it. 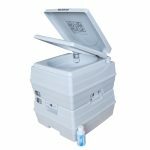 This is another great Drive Medical product that allows you to use at the bedside for those that have a hard time moving to the bathroom. Most reviewers love that portability of it as it easily opens up and folds up flat so that it can be moved around and stored with ease. It has pretty good ratings overall and just a few minor complaints. The most common complaint is that it was much smaller than expected. A few others received damaged items, but were replaced by the manufacturer. 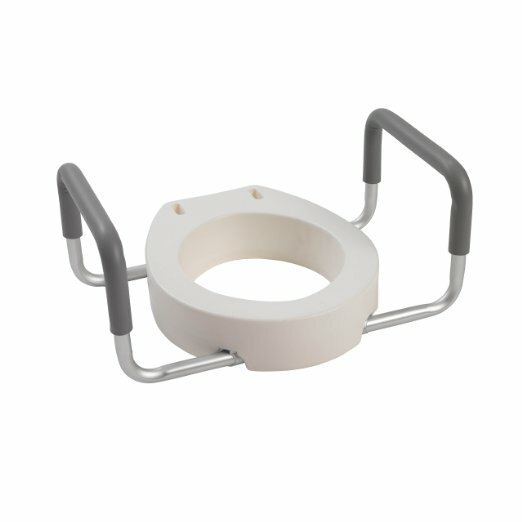 If you have a round toilet, you will enjoy this 3.5” riser for your toilet. 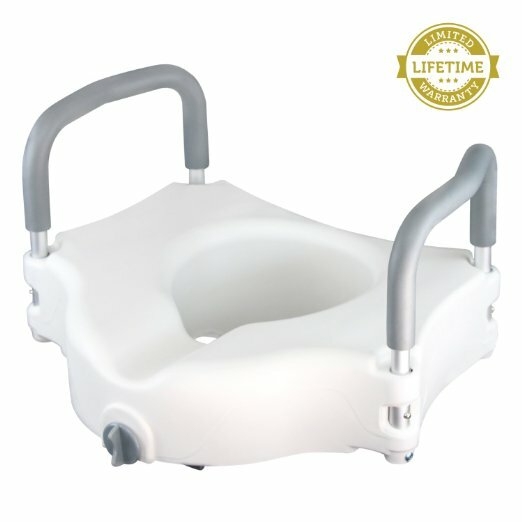 It features sturdy handles and uses the same toilet seat that you already have installed. You simply need to attach the seat to the top of the riser. While it looks great and seems practical, many have had issues with it. Particularly, reviewers state that it is cheaply made and not very stable. This defeats the purpose the chair, so we really can't recommend it. Its not worth the risk of your loved ones safety. 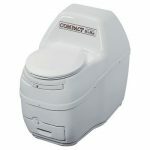 This universal fit seat covers both round and elongated toilet bowl sizes. 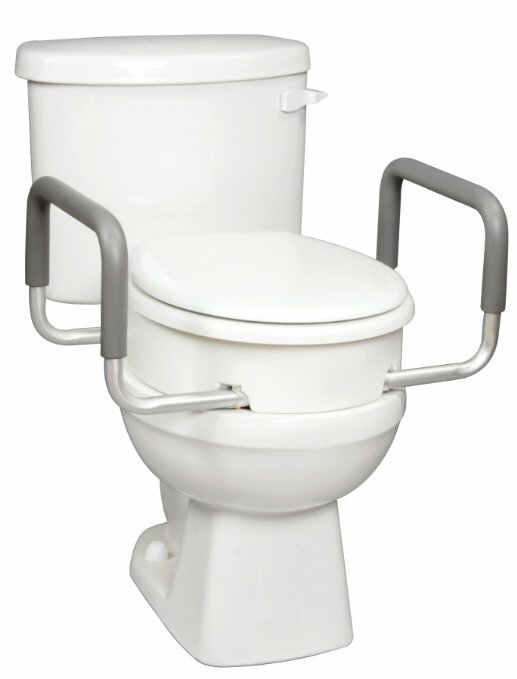 The aluminum legs can adjust to fit your toilet the way you prefer. The toilet seat sitting area is a wide 18.5 inches. 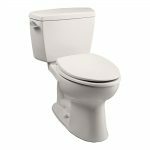 Before you purchase, you should know that you must have a minimum of 4.25 inches between the toilet seat bolts and a gap of at least ¼” between the seat in the raised position and the porcelain surface of your commode. There are few complaints to take note of - mostly that it is not great quality and the size was not right. 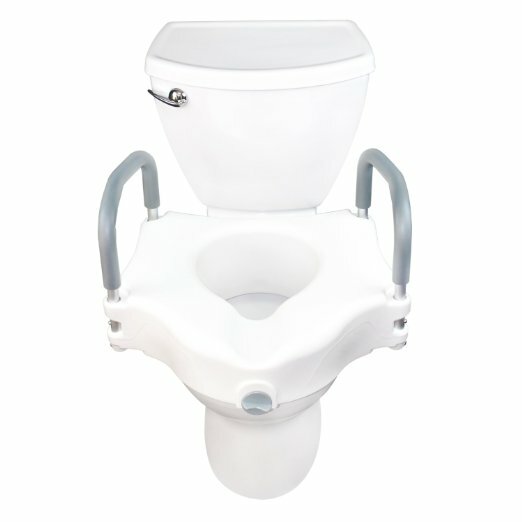 What is a Raised Toilet Seat with Arms? Think about a public restroom. Many of them have safety rails beside the toilet. This is to help people who are older or have trouble sitting/standing. Those same people could benefit from a safety bar at home, but most do not want to put a permanent steel bar in their home. Others may simply not have a wall next to their toilet. That is where the raised toilet seat for elderly and handicapped people comes in. It is raised to make it higher and easier to use. 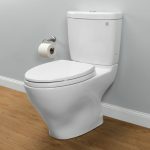 Some people also call them a bariatric raised toilet seat because it does ensure a proper sitting position on the toilet so that your body can eliminate waste easier. Many have arms to give them a place to hold on when they are standing up to increase their stability. At times, the only installation is to set the toilet seat over the existing toilet. 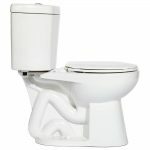 If you choose a raised toilet seat with arms and legs, you will only have to set the taller toilet seat over your toilet. This enables you to move it around as you need to. You can leave it sitting on the toilet at all times or guests can move it when they need to visit your bathroom. Other toilet seats with arms are installed onto the toilet and then the seat is placed over it. 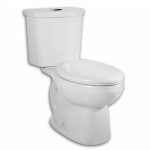 They are often considered risers and most give you a toilet seat that is approximately 3 inches higher. 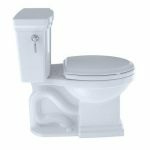 Most state that you do not need to use tools to install it, but you do need to take off your existing toilet seat and then add it on top of the riser. Are Raised Seats Universal Fit? 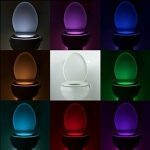 Most all toilet seats are universal fit seats. However, you should be mindful of whether you have an elongated toilet or round to ensure the seat fits where you need it to. You also want to measure your toilet’s seat height before you purchase if you hope to have a raised seat that sits over it. This is because some do require a certain amount of room above the toilet and they may not work with a taller comfort height toilet style.